A little over a week ago, I passed out at the doctor’s office. I’d gone in because I’d been dealing with extreme fatigue for about a month. Every day was a battle not to take a nap. I’d also been feeling pretty weak and I’d put on some weight that I couldn’t seem to get off no matter how hard I worked out (which was tough to begin with because I was feeling so weak). I’d also been bloated and had a number of other issues to discuss. I was not feeling in tip-top shape. Naturally, she ordered a number of blood tests to check for any reason that might be causing fatigue. And by “a number,” I mean “a crap-load.” I should mention that I don’t do well with needles and I have a tendency to get nervous and worked-up prior to the nurse inserting the needle. I breathe heavily as if I’m birthing a child while they take the blood, and then the test is followed with a bit of dizziness and light laughter of relief (relief laughter- it’s a thing, right?). Well, this time around, all was going according to plan until I felt her untie the rubber hose around my arm and place gauze over the wound. I opened my eyes to see at least 8 or 9 viles of blood (my blood!!!) sitting on the table and I quickly looked away. Oh my god oh my god oh my god oh my god oh my god oh my god. I tried to stay calm and continue talking to the nurse about whatever it was that we were politely discussing during the test. As I listened to her, I felt the blood rush to my head and soon the room was starting a slow spin. My legs felt weak. The nurse continued to talk. “Ok, I’m going to throw up right now. This is happening,” I thought to myself. I made note of the nearest sink and I willed my legs to stand up and run to it so I could get it over with but my legs did not move. “I’m going to throw up,” I blurted out, interrupting the nurse. I began to moan (I’m so damn dramatic sometimes) and she ran to me and the next thing I knew, my chair was reclined, I had a bucket on my chest, and another nurse was waving smelling salts over my nose. I realized I was still moaning and I promptly brought that business to a stop. I was soaked in sweat and I was freezing and my teeth began to chatter. One nurse said “Did someone drive you here?” I explained that I drove myself but my husband was working from home that day and he could come get me. She fished my phone out of my purse and I called Chris but all that I could say was “You need a cab. You need to come here. I can’t-” before the nurse took the phone from me and handled the conversation properly. It was decided that I should lay down so the nurses lifted me up and helped me into a wheel chair. I was then taken to an exam room and a paper-covered table/bed was prepared for me. They helped me on to the bed, covered me with a blanket and handed me a warm cup of water to drink. Only I couldn’t hold it. My hands were numb. The nurse massaged my hands until I had some feeling in them. Luckily, I had a vegan bar in my purse that I could munch on to get my blood sugar back to normal. Chris showed up around this time (Thank heavens for Uber. Do you have Uber in your city? It’s way cheaper than a cab and basically amazing). My blood pressure had returned to normal and some color had returned to my face so they let me go. A few days after that episode, my doctor called to tell me that I am vitamin D deficient (I’m not sure how it happened because I’ve always done well in the vitamin D department when it comes to blood tests) and my blood sugar was “quite low.” I just saw an endocrinologist regarding the blood sugar (that’s a story for another day), but I began working on my vitamin D intake as soon as I got the call. The best way to get vitamin D is by spending time in the sunlight without sunscreen. Apparently, my daily walks with my dog weren’t cutting it and I knew I wasn’t going to be able to work more sun time in to my schedule immediately so I needed a supplement. I knew that many vitamin D supplements weren’t vegan because they are usually made with lanolin (oil from a sheep’s wool)(yuck!) so I immediately began researching vegan forms of vitamin D3. Vitamin D2 supplements are generally vegan but D2 tends to be less effective. Thankfully, there are vegan vitamin D3 supplements available and I ordered myself some straight away. Then I headed to the kitchen. There is only one plant-based food that contains vitamin D and that food is mushrooms. There are even some vitamin D-fortified mushrooms out there (just check the packaging- it should tell you)! Luckily, I love mushrooms and I’m totally on board with adding more to my diet. My first mushroom-intensive meal was this portobello mushroom bruschetta. I made a truffled white bean hummus using a little truffle oil and some truffle salt that I picked up in Italy last year (it is available here too, but not for the great price I found it at there). 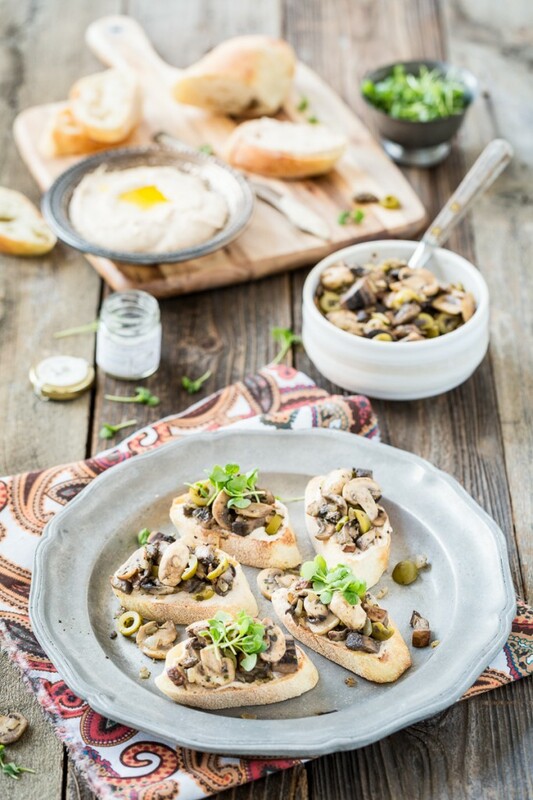 I spread the hummus on some slices of toasted french bread and topped them with some quickly sautéed portobello mushroom chunks, crimini mushrooms, shallot, and olives. Pure magic. 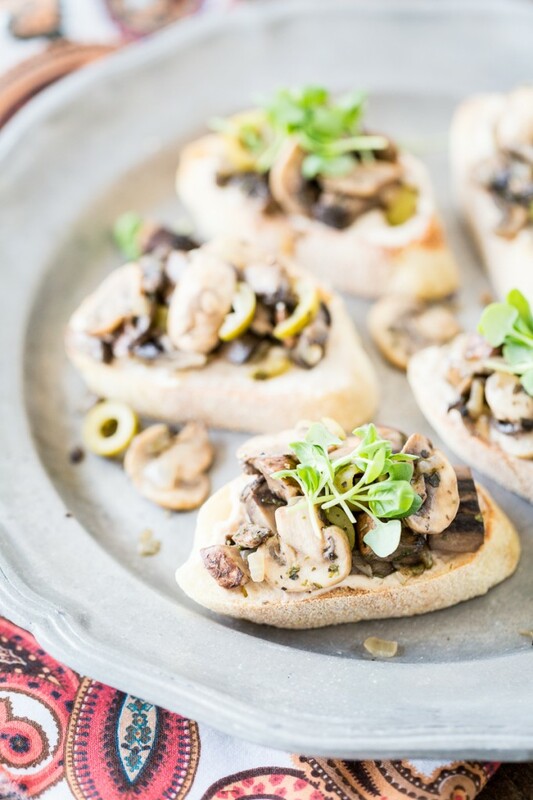 Whether you’re in need of some vitamin D or you love mushrooms, or even if you’re into this whole Fancy Toast trend that’s happening right now, look no further than this delightful little meal. It’s also a great little appetizer if you have guests. If you’re not that into mushrooms, at least try the hummus (if truffles aren’t your thing, just sub olive oil and/or regular salt). It’s basically heaven slathered on toast. 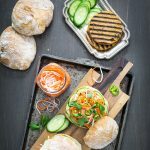 If you were feeling adventurous, you could take it a step beyond bruschetta and just make a full-fledged sandwich. The possibilities are endless, guys! Combine the hummus ingredients in a food processor and process until smooth, pausing to scrape the sides as necessary. Add water or vegetable broth to thin it out, if needed. Transfer to an airtight container and let chill for at least 1 hour to allow the flavors to marry. Preheat the oven to 250 F. Line a baking sheet with parchment paper. Spread the baguette slices out on the sheet and bake for about 10 minutes or until crisp and slightly toasted. Remove from the oven. Chop the portobello cap and stem in to small cubes (roughly 1/2 inch cubes). Heat the 1 teaspoon of truffle oil over medium heat for no more than 15 seconds. Add the shallot and saute for 2 to 3 minutes. Add the portobello and the other chopped mushrooms, along with the parsley and basil. Saute until tender, about 5 minutes. Add lemon juice, salt, pepper, and olives. Remove from the heat. Transfer to a serving dish. 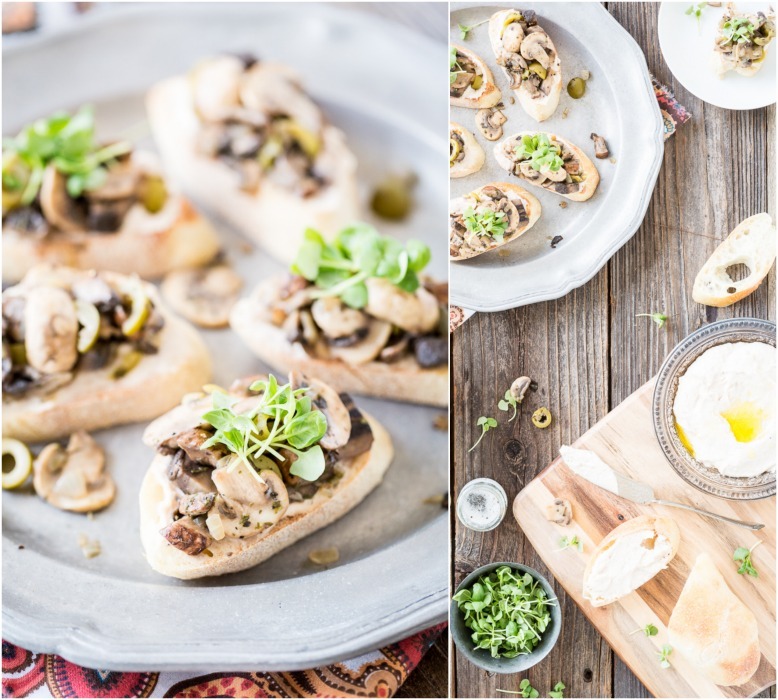 Serve the toasted baguette slices with the hummus, the cooked mushrooms, and the micro greens (if using). 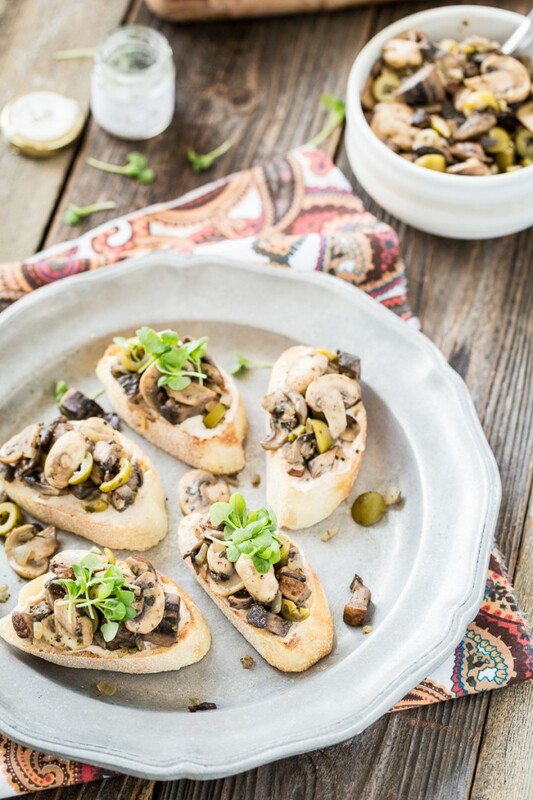 You can either let your guests assemble their bruschetta or you can assemble them before serving. 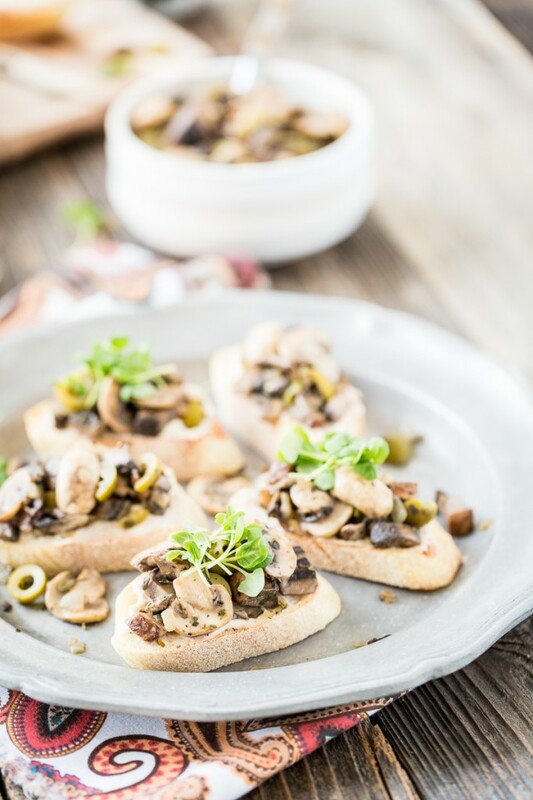 Spread the hummus on the slices of toast, top with a spoonful or two of the cooked mushrooms, and finish with a few strands of micro greens. Enjoy! Have you ever had problems with your vitamin D intake? 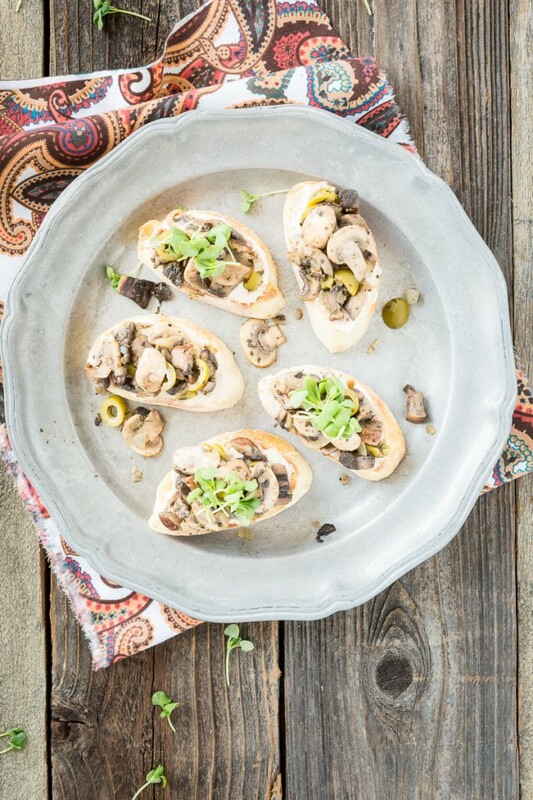 25 Responses to "Portobello Mushroom Bruschetta with Truffled White Bean Hummus"
Wow, Kristy! I’m glad it was nothing more serious – that must have been very scary (maybe more so for Chris when he got the mumbled-jumbled call from you). This is a good reminder to a) get my blood checked regularly and b) get my kids some vitamin D (or mushrooms)! Take care of yourself! Thanks so much! It’s 1 tablespoon. I’ve updated the recipe as well. Thanks for letting me know! Enjoy! What a drama! Poor you Kristy. I’ve had the same thing happen to me when getting blood tests in the past. It always feels like my blood is rising up to my ears, I feel dizzy and sick to the stomach. Not fun. Sorry to hear about the Vit D deficiency but I’m sure you’ll get it back up pronto. I had no idea mushrooms were a good source though I love them anyway, and with truffle oil?! Yum! I’m so glad you’re ok! I relate so much to your experience. I am definitely a “fainter”. Just tell the doctors/nurses next time you’re having blood drawn (or vaccines, or anything that makes you woozy) that you are prone to fainting. They will do all of the procedures with your reclined or completely lying down, and give you several minutes to relax before making you get up and rush out of the exam room. My boyfriend has been battling with Vitamin D deficiency on and off for years. It takes a lot of vigilance to bring your levels up to normal and keep them there. Once he started taking supplements, he was totally on the road to recovery. His mood, sleep, appetite and everything started normalizing. It’s actually a very serious medical issue and only just starting to get more recognition in the medical community (at least, that was our experience). 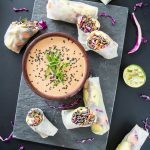 I wish you the best of luck and THANK YOU for this amazing recipe! 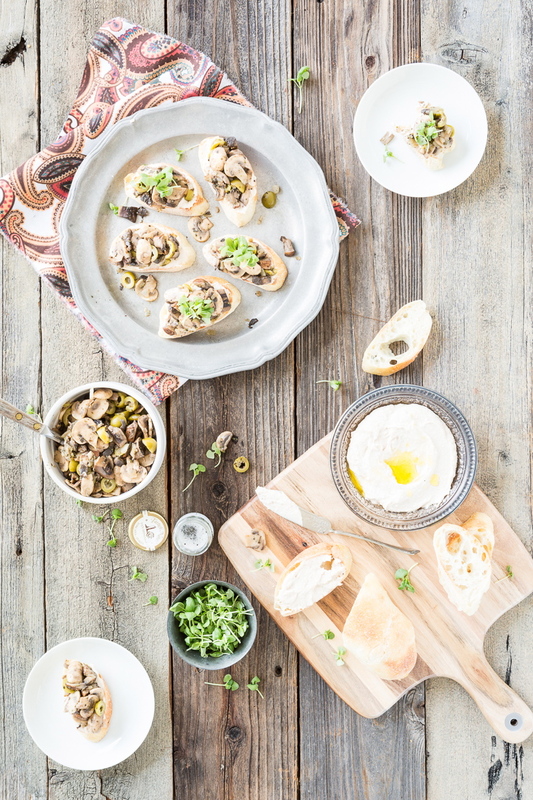 I am always looking for excuses to eat more mushrooms…this looks dreamy! That must have been so scary, Kristy. I also get nervous about having blood taken and let the nurse know in advance so I don’t have to see it. To think I considered med school – ha! I’m even worse when it’s other people (or god forbid my dogs). Wow, I am so sorry you’ve been feeling so awful (and for that awful doctors experience!). I can completely relate. I recently underwent testing due to similar problems you mentions (extreme fatigue, bloating, fogginess, etc.) and the amount of blood they took was insane. But thankfully we both got answers and can work on getting better! Bless your heart, Kristy! That sounds miserable. I’ve heard the latest research is showing that most of us need more vitamin D than we thought we did. In fact, if I remember correctly, the RDA recommended requirement of vitamin D have recently gone up. I could be mistaken, but anyway. Who knew that mushrooms are a food source of Ds??!! 🙂 This is great news! I’ve definitely fainted before at the doctor’s office too after getting a needle. But mine was just because of my fear of needles too!! I’ve also fainted at the optometrist’s office because my brain is just overactive and stupid. I don’t think I’ve ever had a Vit D problem, but because I live up north, I’ve taken a supplement. 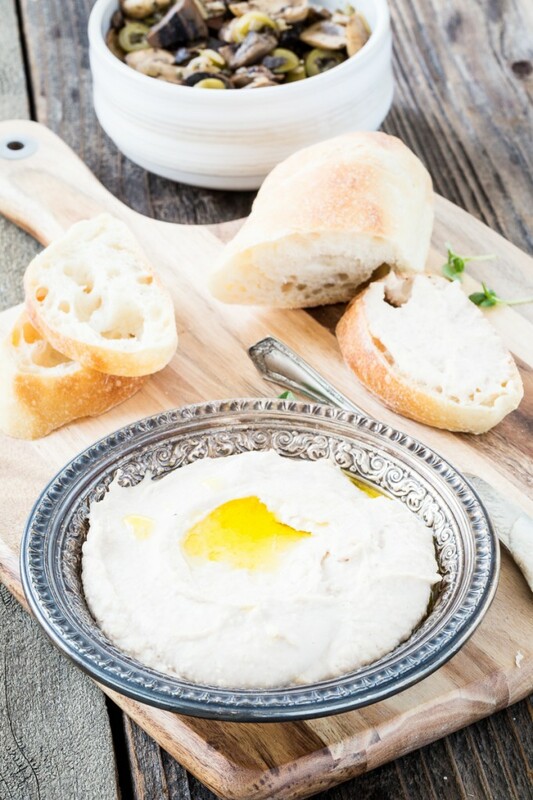 I’m excited for more natural sun now and this white bean hummus! 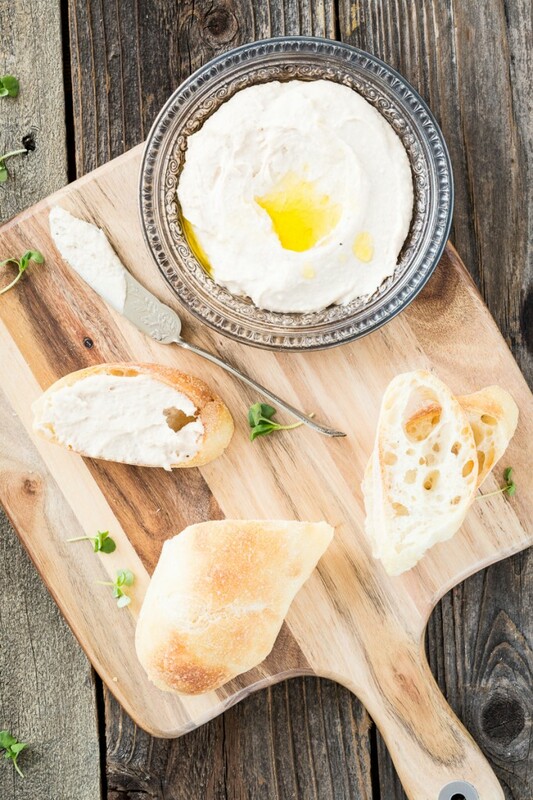 Truffled white bean hummus?! I could eat that every day. You had a classis vagal reaction which is really no big deal and anyone trained in phlebotomy knows how to take care of. It’s all because the blood rushes OUT of your head vs to your head as you described. In. The future let the tech know you get vagal and they will be better prepared. You can do the following, don’t look at your arm or the tubes. Then, as they are taking blood wiggle your toes. It’s a distraction technique. Then to keep your blood pressure up gulp some air and bear down as if having a bowel movement. This is called a valsalva maneuver. High test pilots use it to keep their blood pressure up when experiencing G forces. It works. Usually people recover from a vagal reaction in 20-30 minutes and are completely fine to go on with their day. Just drink a lot of water to replenish volume. how scary, kristy! i’m so glad it wasn’t something more serious. you just inspired me to get back on the ball with supplementing. i stopped taking my multivitamin a few months ago when i think they changed the formula and i had a bad reaction to it. just did a little research, did a fb poll, and ordered b12 and vitamin d3 on vitacost. let’s do this thing! also, this looks perfect to get more vitamin d. i LOVE mushrooms. had no idea that they were high in vitamin d! Goodness, that must have been scary! I’m glad you’re ok now, or at least on the mend. I have to say it’s been a while since I’ve had a blood test, best to get one done sometime soon (except I don’t think the NHS gives out blood tests until you’re quite ill…). I haven’t eaten mushrooms in ages, either. This looks yummy! I love mushrooms. And I am a fan of Vitamin D, too. But not needles. How yucky! So sorry to hear about your experience, but I’m glad it was nothing more serious. I’ve been on prescription high-dose, monthly Vit. D for 2 years now and take ~3000 IUs daily as well (and I’m highly sensitive to mushrooms 🙁 ). Unfortunately, it hasn’t done anything for my fatigue, but has certainly helped my bone health. I hope you get it all figured out! A lovely recipe for a great reason! Hope you’re back to feeling like your usual self soon. Thanks for sharing the recipe and the story – many people struggle with Vitamin D intake!! Oh goodness and I thought I was bad when I have my blood taken (for the record you are not alone with the Lamaze style breathing) 🙂 So glad you found out wny you were not feeling so hot – to my knowledge I have never had any issues with vitamin D, I do have another round of blood tests coming up so your research may come in handy one day. Sorry to hear this was so traumatic for you, Kristi. Your day to day symptoms sound like hypothyroidism, but I am sure your doctor checked for that. I recently was found to have vitamin D deficiency, too. However vitamin D deficiency is so common in Canadians (at least 25%) they recommend supplementation without testing your levels. Hope you feel better soon. So good….I wasn’t even looking for a recipe to help with my constant battle against low vitamin D. I just wanted something tasty. I’m going to make this all the time! 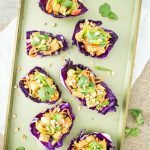 It’s been almost three years since you posted this recipe and told about your health challenges. Hopefully you are feeling much better now. I made this recipe tonight (along with a chopped green salad). I didn’t have all the exact ingredients, but it was a big hit, nonetheless. 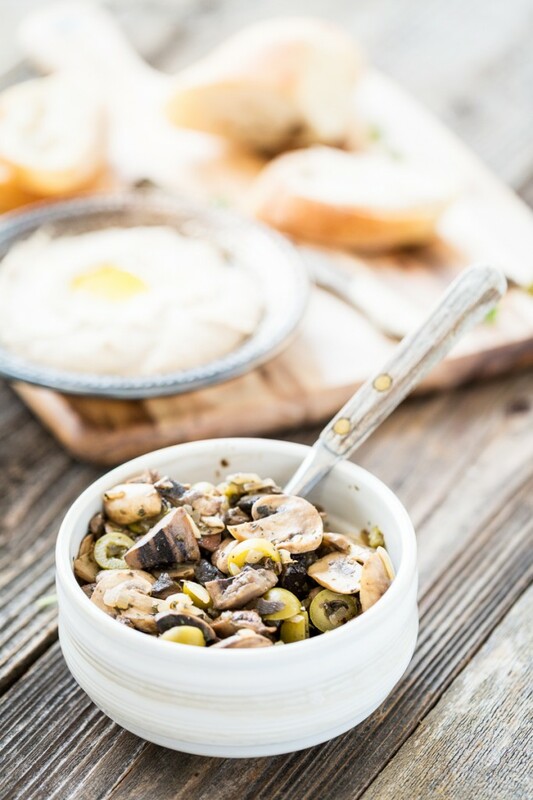 (No portobello, just criminis; capers instead of green olives; sweet onion instead of the shallot.) Restaurant quality! Yum! Thanks for sharing!